Not a problem for its manufacturer. US revenue from the drug HAS more than doubled in That Time, up to $ 2 billion last year. The key: Increases repeated price. The multiple sclerosis drug's maker, Biogen Inc. raised its price an average of 16% a year Throughout the decade-21 times in all. It is an example of drug companies' unusual ability to boost prices beyond the inflation rate to Drive Their revenue, Even When demand for the drugs does not cooperate. A result of this pricing power across That's 30 top-selling drugs sold by pharmacies, US revenue growth HAS far outpaced demand in the past five years, accordion thing to a Wall Street Journal analysis of corporate filings and industry data. Revenue growth averaged 61% , three times the increasement in prescriptions. HAS attention focused lately on new drugs with eye-popping prices and on a few Whose price a new owner abruptly raised several-fold. But what many drug companies Rely on for sales growth is a pattern of steady Increases, year in and year out, on older medicines. Wholesale Price Increases for the 30 drugs Analyzed by the Journal averaged 76% over the five-year stretch from 2010 through 2014. That was more than eight times general inflation. For 20 leading global drug companies last year, 80% growth in net profits stemmed from price Increases in the US, According to a May report by Credit Suisse. Pricing power helps some in the pharmaceutical industry to Compensate for sluggish demand, new competition or weak product pipelines. "Pricing HAS covered up a multitude of other disappointments over the past 15 years" in the sector, Said Geoffrey Porges, a biotech analyst at AllianceBernstein LP. This is no cause for cheer, of course, to certainement other market participants, notably the many large companies That pick up the tab for Their employees' prescriptions. Drug pricing HAS Helped drive up spending on benefits at Lowe's Cos., Said Bob Ihrie, a senior vice president at the home-improvement retailer. "It's one thing When you read about a new drug in the newspaper, and all the costs of launching it. But when it's drugs thathave put on the market and you see price Increases thesis, you go, 'Why would this be?" 'Mr. Ihrie said. "I feel like we're really being taken advantage of." Pharmaceutical companies defend their pricing as helping to finance development of innovative medicines, an expensive and risky enterprise They Say would not attract investment without the potential for large returns When a new drug succeeds. Many in the industry also say a focus on drug prices is shortsighted Because It overlooks drugs' role in helping to contain overall health-care costs by Preventing disease complications. Robert Zirkelbach, a spokesman for Pharmaceutical Research and Manufacturers of America, a trade group, Said That Eventually, prices for all drugs will decline sharply whenthey lose patent protection and go generic. Avonex maker Biogen HAS Noted the central role of price boosts in the drug's success. "For 2014 Compared to 2013, in the increasement US Avonex revenues were Primarily due to price Increases, partially offset by a decrease in unit sales volume of 10%," Biogen Said in its 2014 financial report. A similar note HAS Appeared in its annual reports since 2005. 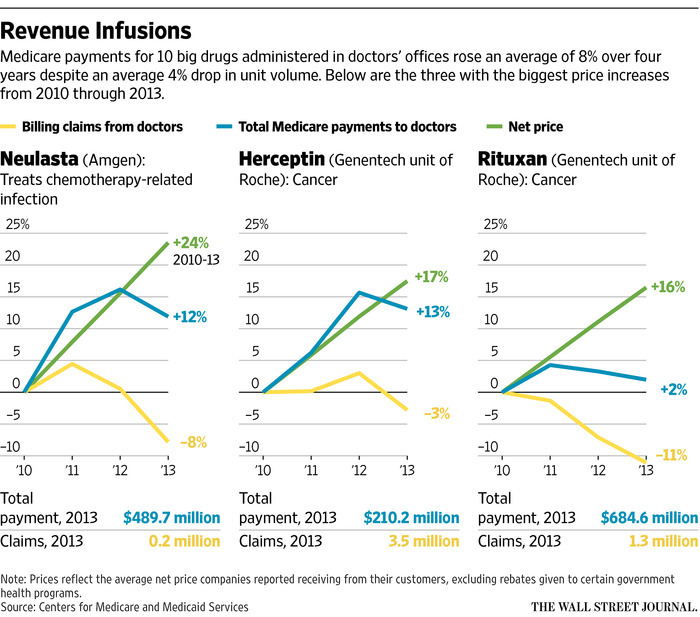 But Biogen points to the way this revenue funds its quest for new medicines. The company spent an average of $ 1.19 Billion Annually on R & D from 2005 through 2014, or 24% of total revenue. Besides Avonex, the company HAS brought` out two other multiple sclerosis drugs and is studying a treatment to repair nerve damage from the disease. "Over the past two decades, All-which is the life of Avonex, we've done more than any other company to Improve the treatment of multiple sclerosis, as as as as" said Daniel McIntyre, a senior vice president of Biogen. "The Reality Is that revenues from therapies available today make this possible." What gives the pharmaceutical industry so much pricing power? Part of the reason is the patent protection drugmakers have on new products, competitors from offering-which keeps copies for up to two decades. "It's Easier for Consumers to substitute a car That Meets Their Needs than it is to substitute a patented drug Because no one else can make it, as as as as "said Fiona M. Scott Morton, an economics professor at Yale University. Another part of the answer is the insurance-based health system, in-which Consumers rarely feel the full brunt of price Increases. Click here to read more.